Rep. of the VC, the DVC (A), Prof. Toyin Arowolo (Right) addressing the students in one of the COBFAS communities at Iwoye-Ketu. The Onisaga of Isaga-Orile, Oba Joseph Oladele Tella and the Ooye of Iwoye-Ketu, Oba Joel Ademola Alaye had pledged more support for students of the University, who are undergoing their Farm Practical Year (FPY) training in their domains. The Monarchs said they were ready to provide more land if the 50 Hectares already provided are insufficient for the Scheme. They passed a vote of confidence on the conduct of the students, saying that they are of good behaviour and “we have accepted them as our children”. In his remarks, the Vice-Chancellor, Professor Olusola Oyewole, commended the royal fathers for their unflinching support for the University. Represented by the Deputy Vice-Chancellor (Academic), Professor Toyin Arowolo, the Vice-Chancellor was accompanied on the tour by the Heads of Departments of Agricultural-related courses. A major objective of the tour was to get first hand information on the welfare and activities of the students in the communities. Speaking separately to the students at Isaga-Orile and Iwoye-Ketu, the Vice-Chancellor said he was delighted to be in their midst, adding that he acknowledged the good works they had been doing in the past few months. Professor Oyewole said there were bound to be difficulties when a programme like this is in its early stages, declaring that over time, it would get better. He, however, encouraged them to continue to be good ambassadors of the University as he told them not to see the training as a punishment. Speaking, the Head of Department, Agricultural Economics and Farm Management, Professor Adewale Dipeolu stated that the nation needs them, adding that the country actually depends on the rural communities. According to him, “you are here because you want to know how the other side is, as those who feed us, feed Nigeria”. He advised the students that for someone to be successful in life, there must be sacrifices, noting that “no pain, no gain”. In the same vein, Professor Abayomi Aina enjoined the students to take the training very serious as they may become employers of labour in future. Similarly, the Head, Horticulture, Professor Isaac Aiyelaagbe charged the students to work harder to see the opportunities inherent in the Scheme, noting that they had once went through the process. Coordinators of the Farm Practical Year in both communities commended the Vice-Chancellor and the team for the visit. 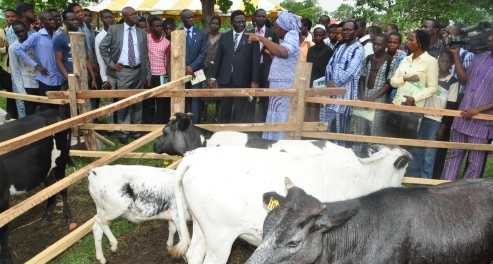 The Departments whose Heads accompanied the Vice-Chancellor on the tour are, Animal Production and Health (APH); Animal Breeding and Genetics (ABG); Animal Nutrition (ANN); Pasture and Range Management (PRM); Animal Physiology (ANP) from the College of Animal Science and Livestock Production (COLANIM). Others are Soil Science and Land Management (SSLM); Crop Protection (CPT); Horticulture (HORT), Plant Breeding and Seed Technology (PBST); Plant Protection and Crop Production (PPCP) from the College of Plant Science and Crop Production (COLPLANT).